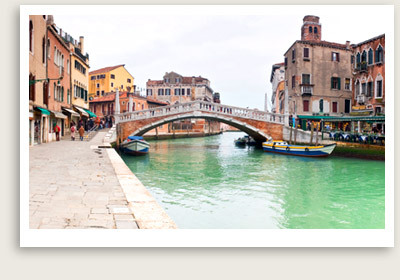 Includes: This private shore excursion to Venice and the Jewish Ghetto include roundtrip transportation from Venice port, services of a Venice tour guide, entrance tickets to synogogue. Not Included: Entrance tickets to sites you decide to enter besides the synogogue. All our private shore excursions from Venice’s San Basilio and Marittima can be fully customized for families, couples or private groups. This unique private shore excursion features a guided tour of Venice’s ancient Jewish ghetto, located in the Cannaregio district. This area of Venice is one of the city’s most authentic, and yet quite unknown to tourists. In this private tour of Venice, you will see important historical and artistic reminders of the past on this tour, which starts from Rialto, where various foreign communities have lived throughout history. You will continue your Venice shore excursions with the Jesuits’ Square, whose church features an important Titian painting and the small precious oratory of the Crociferi. From the church you will visit the Scuola of the Misericordia and then we walk along the fondamenta (a Venetian term for a long street running along a canal or pier) to a small shipyard. You can stop in the nearby church of the Madonna dell’Orto to admire some of Tintoretto’s celebrated works. In this multicultural area, far from the center of power, the Jewish ghetto was born in 1516. Your tour guide will help you to understand what distinguished this area from all other Jewish neighborhoods in Europe at that time, and share with you the history of the Venetian Jews, still an important community here today. Another option for this escorted Venice tour on every morning but Saturday is to actually visit the synagogues. Time permitting, you can also view the imposing Labia Palace, once the residence of a family belonging to the new aristocracy, although today it is the headquarters of Italian public television. If you book your tour in advance, you can visit the lovely ballroom frescoed by Giambattista Tiepolo with the story of Anthony and Cleopatra. This shore excursion in Venice also takes to a walking tour of lively San Polo, located in Rialto, the commercial center of the Republic of Venice. Your private tour guide will tell you about the foreign merchants that came here from far and wide to sell precious products like fabrics and spices. Today, you can still visit the outdoor fish and produce markets. The guided tour continues through the narrow, winding back streets to reach San Polo Square and its ancient palaces. From here, you will reach the Frari campo (square) with its magnificent church, where you can admire masterpieces by Giovanni Bellini, Titian and other artists. Your free time follows after the morning session with your Venice tour guide. After lunch and some free time, you will tour with the your guide again until it’s time to return to the ship.